Edmond is an experienced community liaison officer, having worked for MG Corporation or its associated entities for over seven years. 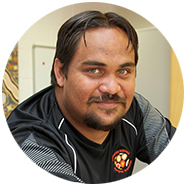 Edmond has previously worked as a Ranger in the East Kimberley region, during which time he facilitated a broad range of consultation activities with various communities. Edmond has also been involved in delivering wet season programs through MG Services (a former related entity of MG Corporation), which required engaging with Aboriginal people, communities and Indigenous organisations to facilitate service delivery, such as identification registration. Having lived and worked in the East Kimberley his entire life, Edmond has developed strong connections with key stakeholders across the region.